Shane Hastie leads the Culture and Methods editorial team for InfoQ.com where he hosts the weekly InfoQ Culture Podcast. He is the Director of Agile Learning Programs for ICAgile. He has oversight in the strategic direction and expansion of ICAgile’s learning programs, including maintaining and extending ICAgile’s learning objectives, providing thought leadership, collaborating with industry experts, and supporting the larger ICAgile community. Over the last 30+; years Shane has been a practitioner and leader of developers, testers, trainers, project managers and business analysts, helping teams to deliver results that align with overall business objectives. He has worked with large and small organisations, from individual teams to large transformations all around the world. He draws on over 30 years of practical experience across all levels of Information Technology and software intensive product development. Shane was a director of the Agile Alliance from 2011 to 2016 and is the founding Chair of Agile Alliance New Zealand. "I firmly believe that humanistic way of working and the agile mindset are desperately needed in organisations all around the globe today. Taking agile values and principles beyond software is important and making sure they are properly embedded is absolutely crucial for success – we’re in an industry that touches every aspect of people’s lives and massively influences society as a whole and I want to be a part of making sure that industry is both ethical and sustainable." "The world is changing more rapidly than ever before and organisations of every size are struggling to remain relevant in the eyes of their customers. It is only high-performing, adaptable and agile organisations that will leverage, lead and thrive in this ambiguous and unpredictable market. 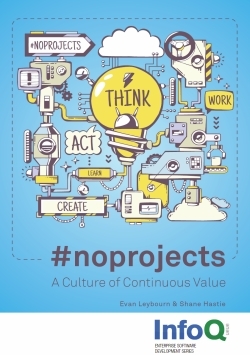 In this book, we want to show you a new way of thinking about structuring your work - away from a temporary endeavour to a continuous flow of value." This book is far more than just a catalogue of practices and tools which you can apply in your product development. It contains inspirational stories from individuals, teams and organisations who have switched to this new way of thinking and working. It exposes the risks on the pathway and how others have overcome these obstacles.